We’re not going to talk about some Japanese car manufacturer taking over an American car factory, but about the Joe’s first real Marine, Ettienne R. LaFitte, better known as Gung-Ho. Shown here in his dress blues, is actually also how I first got to know the figure. I hadn’t read any of the comics or seen the cartoons when I started collecting (okay, back in the day it was called playing) with Joes. 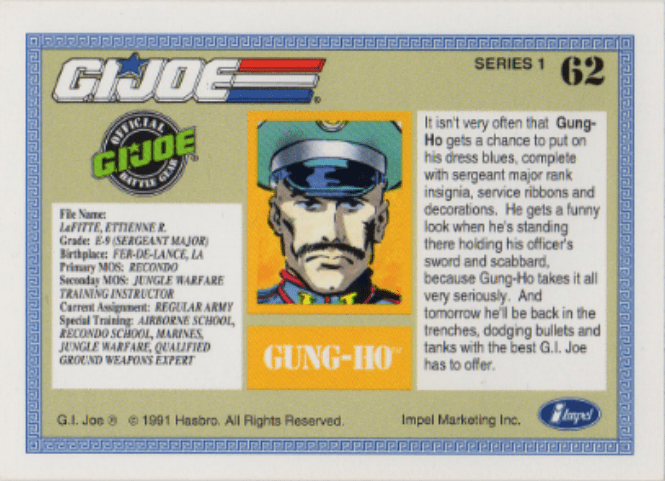 So I had no idea how Gung-Ho looked like in his more regular Joe outfit. I have to say, he scrubs up nice 🙂 With the pornstache, bald head, bare chest, … I can’t help but think of The Village People. Y-M-C-A, it’s fun to — ok, let’s not go there. 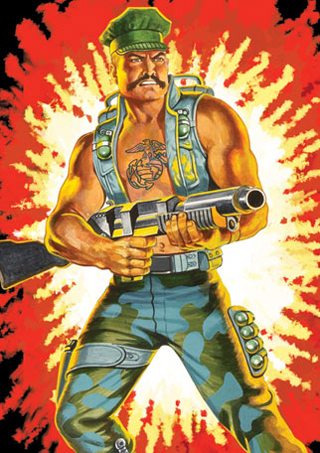 In the comics, Gung-Ho is part of the backup team in Alaska when Cobra’s new specialist (Destro) first appears. He is later assigned to the guard detail on Cobra Commander, eventually getting injured at the hands of Storm Shadow, leading to the discovery of Snake-Eyes and Storm Shadow sharing the same tattoo. Between 1983 and 2015, 21 figures of Gung-Ho (or Gung Ho) have been released. Surprisingly, most of these show him wearing a shirt. The first figure of Gung-Ho I had, was the dress blue version of 1987. In my younger self’s headcanon, he was some sort of Army Brass, a high ranking officer coming down to inspect the Joes. 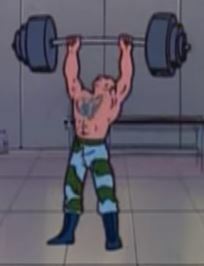 I have a few of the later iterations now and I have to say, he’s not my favorite Joe, but I suppose it’s admirable that he runs around bare-chested a lot, dropping that huge USMC tattoo on his chest in your face. In the cartoons, Gung-Ho is always there, fighting for freedom over land and air. But mostly, showing off… see below. Or talking to his gun as if its a child. That’s all for now. Next time, we’ll aim for the moon and end up somewhere in space. Until then, Happy Collecting and YoJoe! Author European JoePosted on November 26, 2017 Categories G.I. 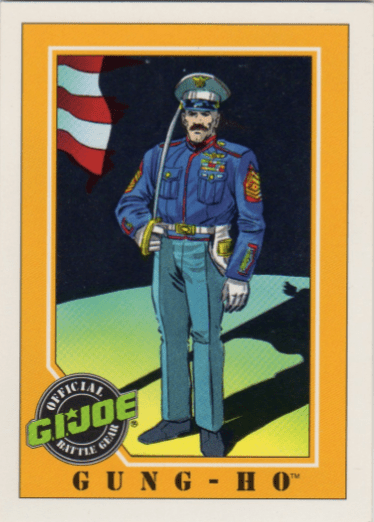 Joe, TCGTags #62, gijoe, gung-ho, impel, trading cardsLeave a comment on Hadleyville,PA or the Bayou?